Jason and I are constantly debating the word pecan. He insists that it’s pronounced puh-kahn but I say pee-can. Anyone else experience this in your family? Regardless of how you say it, pecan pie is probably one of our favorite holiday pies. The crispy crust and the melt-in-your-mouth filling is comfort food at its best. We know, it’s full of sugar and calorie-packed, but we love each slice filled with all of those glorious grams of sugary calories. And hey, it’s the holidays. We deserve to indulge a little (and so do you). Start by combining the flour and salt in a large food processor bowl. Cut in the butter (or you can use shortening) by pulsing the processor until the mixture looks like coarse crumbs. Drizzle in the 1/2 cup of very cold water, pulsing until the dough forms. Then divide your dough in half, shape it into balls. Wrap the two dough balls in plastic wrap and refrigerate overnight (or at least 4 hours if you’re short on time). Save one dough ball for another recipe, wrapping it in another layer of plastic wrap and freeze. When you’re ready to use the crust, simply roll it out on a flour covered surface. Try not to over work it. If you prefer a sweeter crust, add a little bit of sugar to the original dough mix. 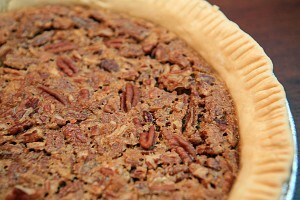 After dough is rolled out, place it in a pie plate, bake at 400 for 10 minutes. Remove from the oven and set aside. Preheat oven to 400. In a large prep bowl, whisk together the melted butter, egg, brown sugar, vanilla and salt until smooth. Add in the pecans, stir to combine. Pour into an unbaked 9 inch pie shell. Bake in for 10 minutes, then reduce temperature to 350 degrees and bake for 30 to 40 minutes, until the filling is set. Recipe says to pour in 1/2 the pecans but never states when to add the other 1/2 of the pecans. Am I reading it wrong? Hi Sandy – We corrected the directions. Thanks for catching that!